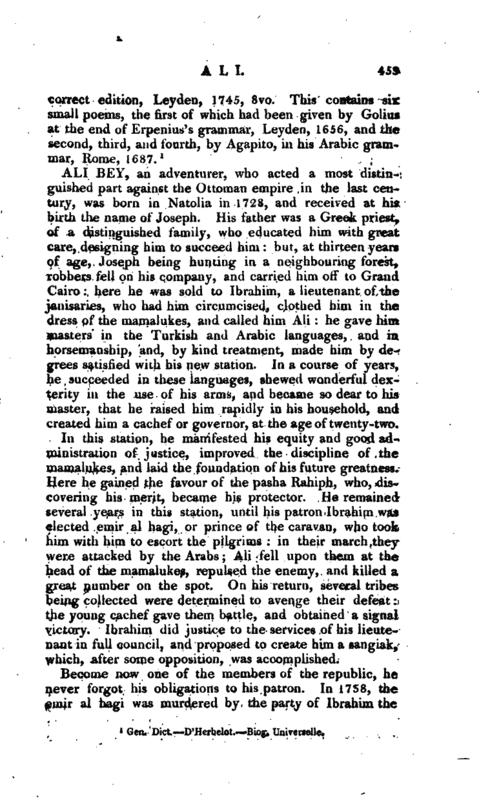 , the cousin and son-in-law of Mohammed, ought, perhaps, to have been caliph after Mohammed’s death; but beipg opposed by Omar and Othman, he retired into Arabia, and there made a collection of the doctrines of Mohammed, and in this he permitted some things condemned by Abubeker, which gained him many proselytes. 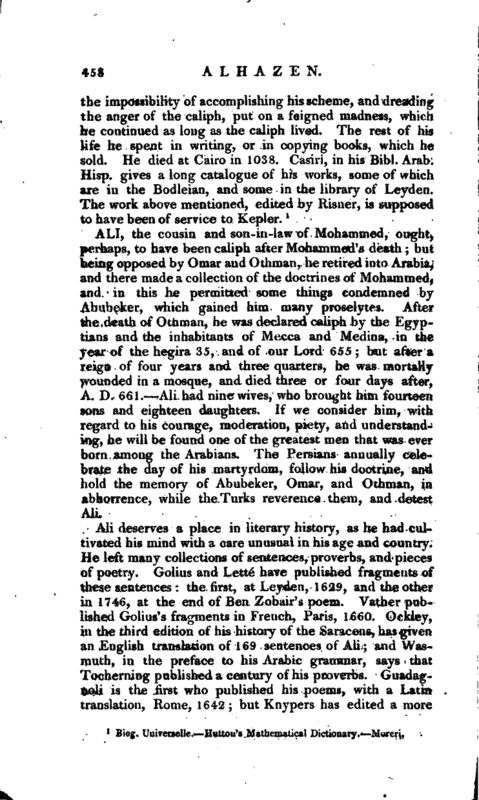 After the death of Othman, he was declared caliph by the Egyptians and the inhabitants of Mecca and Medina, in the year of the hegira 35, and of our Lord 655; but after a reign of four years and three quarters, he was mortally tvounded in a mosque, and died three or four days after, A. D. 661. Ali had nine wives, who brought him fourteen sons and eighteen daughters. If we consider him, with regard to his courage, moderation, piety, and understanding, he will be found one of the greatest men that was ever born among the Arabians. The Persians annually celebrate the day of his martyrdom, follow his doctrine, and hold the memory of Abubeker, Omar, and Othman, in abhorrence, while the Turks reverence them, and detest Ali.